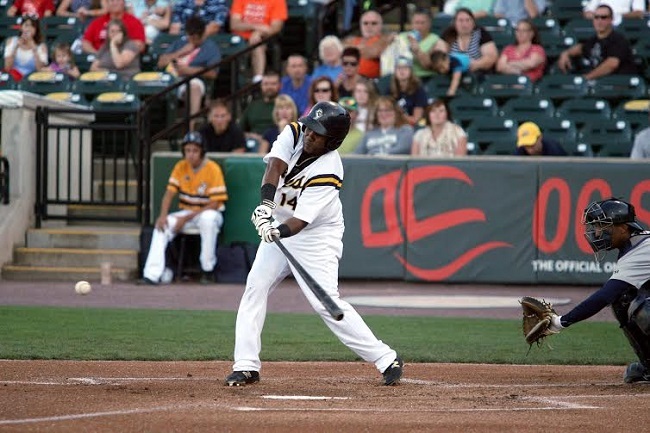 YORK, PA -- The York Revolution have announced that the Atlantic League contract of outfielder Jose Constanza has been purchased by the Tampa Bay Rays. It marks the first time in the nine-year history of the Revolution that Tampa Bay has purchased the contract of a York player in-season. As the Atlantic League continues to affirm itself in the highest levels of professional baseball with “Major League Ready” players, Constanza will be added to Tampa Bay’s 40-man Major League roster shortly, of which all players are eligible to play in the Major Leagues as of September 1 for the remainder of the regular season, per MLB rules. After a short stint with the Triple-A Durham Bulls, whose season ends on September 7, it is likely Constanza will be promoted to the Rays to finish out the year in the Majors. Doing so will make him the ninth former Revolution player to reach Major League Baseball. Constanza will also become the first player to play in the Rays organization following a stint in York. To date, in nine seasons the Revolution has placed a former player with 26 of the 30 MLB clubs with the addition of Tampa Bay (including in-season and off-season signings), leaving the Chicago Cubs, Houston Astros, Seattle Mariners, and New York Yankees as the only remaining organizations that have not employed a former York player. At 31, Constanza is in his 11th professional season. A veteran of 112 Major League games with the Atlanta Braves over four seasons (2011-2014), Constanza has posted a .273 average in the Majors, including a .303 showing in 42 games in his MLB debut in 2011. Constanza began this season in the Cincinnati Reds organization, playing in 41 games at Triple-A Louisville. He then chose to sign with York on July 26, in order to showcase his talents for all 30 MLB organizations, in hopes it would lead to an opportunity such as this. In 30 games with the Revolution, Constanza led the team in batting at .324. He drove in 13 runs and stole 20 bases as York’s leadoff man, and legged out two triples and three doubles in his time with the Revs. Constanza twice went 4-for-6 against the Southern Maryland Blue Crabs, in a 9-1 win at home on August 6 scoring two runs (double, RBI), and again in a 5-4 victory on the road August 18, where he scored three times with a double. Constanza accumulated 10 hits in his final four games with the Revolution, and registered a multi-hit game in 14 of the 30 games he appeared in with York. He averaged nearly a run a game, scoring 29 times in that span. Constanza twice stole three bases in a game for the Revs, and twice stole home for York. In the August 18 game at SOMD he scored after swiping home on a double-steal, and August 28 at Somerset, he stole home again on a pickoff move to first to give York a 1-0 lead in the third inning. Since the beginning of last season, the Revolution will have seen six former players appear on Major League rosters with the eventual addition of Constanza, a number unmatched over that period by any Atlantic League franchise. LHP Scott Rice (Mets), LHP Ian Thomas (Braves/Dodgers), RHP Julio DePaula (Orioles), LHP Ryan Feierabend (Rangers) and 3B Andy Marte (Diamondbacks) have all donned Major League uniforms between April 2014 and the present after playing in York between the 2011 and 2014 seasons. Constanza’s route from his final Atlantic League game to the Majors will be the shortest since the Cleveland Indians signed LHP Scott Kazmir for 2013, following 13 starts for the Sugar Land Skeeters at the tail end of the 2012 season. Out of spring training, Kazmir made one start at Triple-A Columbus before joining Cleveland for the entire season. Constanza’s journey to Tampa Bay will be the shortest for an Atlantic League position player since Hall-of-Famer Rickey Henderson was signed by the Los Angeles Dodgers off Newark’s roster in 2003, and placed directly on the Dodgers Major League roster.